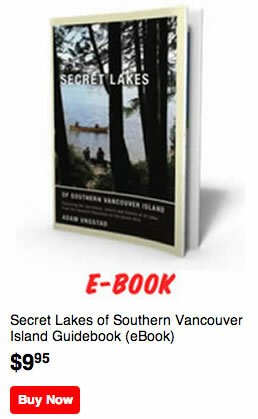 From a pleasant afternoon with the family at Glen Lake, to a blissful bike ride to Metchosin’s hidden beauty Blinkhorn Lake, all the way to an epic day hike to Sheilds Lake in the Sea to Sea Regional Park Reserve near Sooke, this book is essential for outdoor enthusiasts of all levels. Take your canoe and enjoy a picnic lunch at the secret beach at Kemp Lake near Sooke , or go for an enjoyable stroll with your dog down Langford Lake’s Ed Nixon Trail, or even take part in the annual valentines day bird count at Swan Lake. If fishing is your thing, head out to Spectacle Lake in search of eastern brook trout. Lakes offer an incredible amount of recreational opportunities, and this book is your guide to finding the best spots for what it is that you like to do. Summaries of activities such as swimming, hiking, fishing, boating, and beaches are provided for each lake. Have a look at the samples section to see how this book will help you make the most of your time outdoors!